The gun comes in an Angle-LOC moulded carry case that can double as a hands-free gun holder. Within the sturdy case, each attachment has its own place. It's a bit slow to turn off. 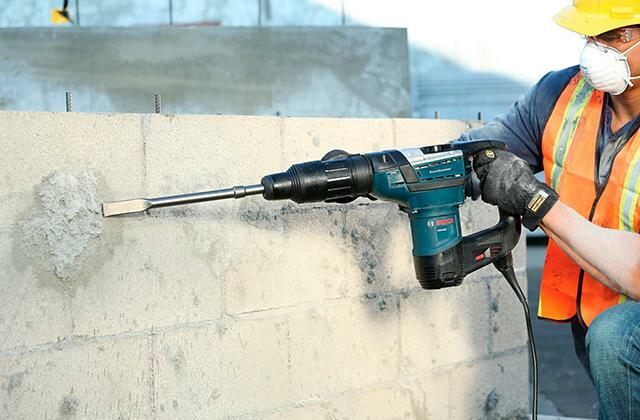 The Wagner Furno 750 is perhaps the best heat gun on our list. It belongs to the category of professional-grade models and boast extremely high power and variable heat/speed settings. All this makes it fit for most any task. The tool comes with an extra-long 2.8-meter cord allowing you to work comfortably fairly far from a power socket. Plus, it has a protective casing which allows preventing the tear and wear and other damage. In max airflow mode, it might seem too noisy. 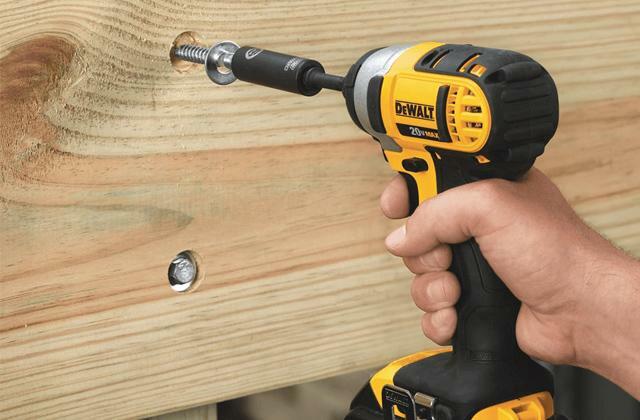 This Dewalt stripper is designed for hobby and light professional use. Able to work for extended periods of time without overheating, it will suit any worker, professional and amateur alike. 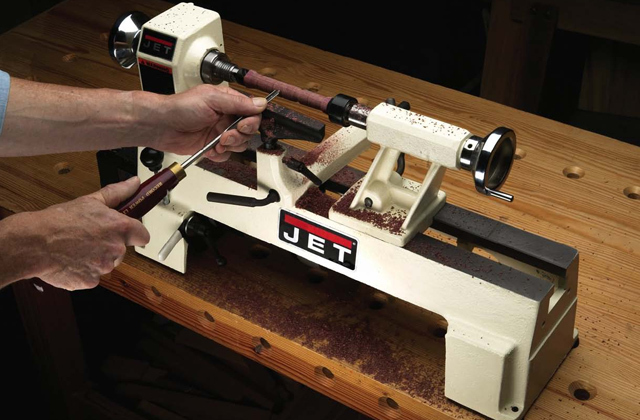 The light weight allows using this gun as long as required without hand fatigue. And the built-in stand allows for hands-free applications. No additional attachments in the set. 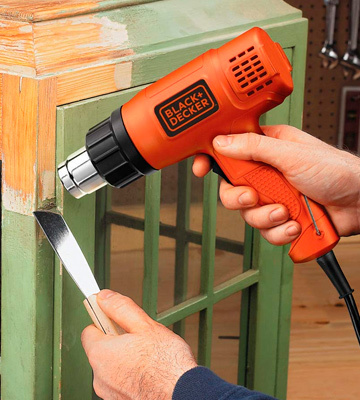 If you need a simple, budget-friendly heat gun from a trusted brand, the Black+Decker KX1650-GB is a perfect match. It allows you to tackle a number of coatings easily. Great for basic jobs. This heat gun comes with an extended set of extra accessories, including even a special nozzle for BBQs and fireplaces. It has no built-in hang ring for storage. 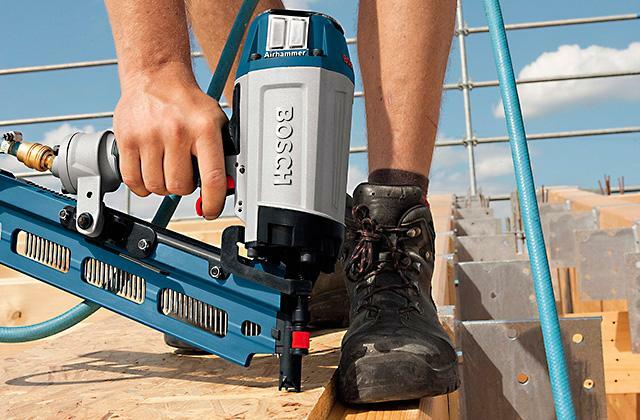 The Tacklife HGP72AC is a powerful, reliable, safe, and reasonably-priced heat gun. It comes with a generous set of extra accessories and is suitable for a variety of uses. The air vents placed strategically across the casing ensure high-quality cooling of the built-in motor. Yet, no dust particles can enter the gun. The max heat could be higher. 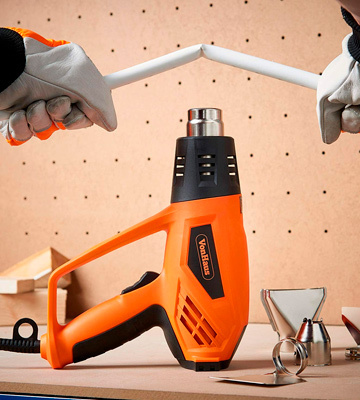 Though the VonHaus 15/181 Heat Gun can't boast of ultra-high heat, it's still great for a whole host of DIY tasks. 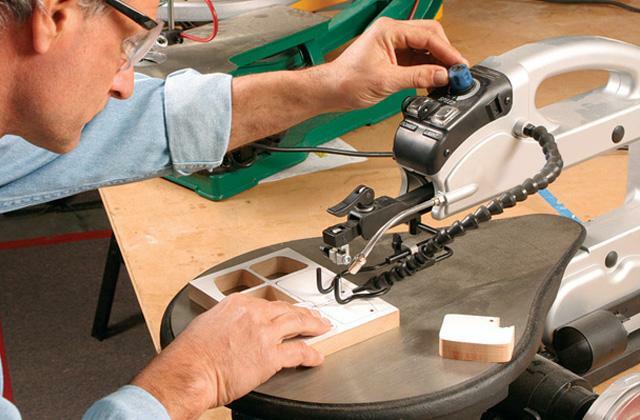 A good option for those who look for a basic tool to perform home projects. With extremely high power and variable heat settings, the Wagner Furno 750 definitely falls into the "professional" category and can cope with almost any job. 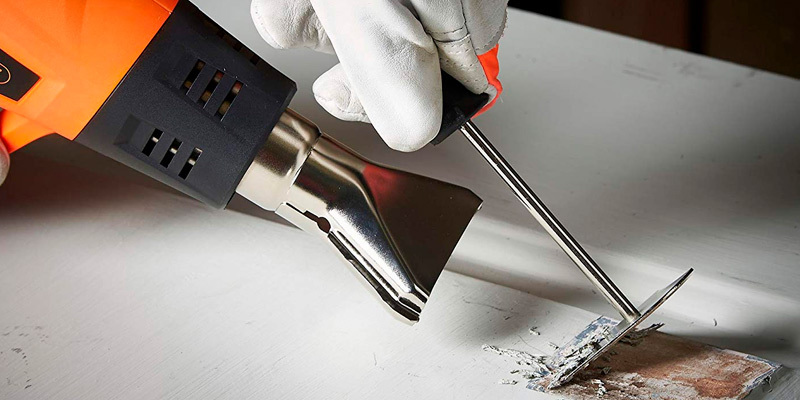 Apart from the primary purpose, that is to be used as a paint stripper, this heat gun can come in handy for such purposes as lighting the barbecue, defrosting pipes, waxing skis or snowboards, removing vinyl tiles, shrink wrapping, bending plastic pipes, and many other things where heat is required. 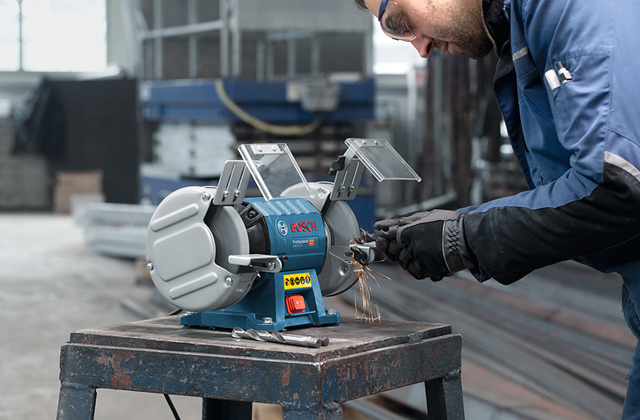 The Wagner Furno 750 feels comfortable in the hand and, whilst not the lightest out there, can be used for extended periods of time without hand fatigue. Rated at 2,000 Watts, the gun is able to generate a heated air flow from 50 degrees C up to 650 degrees C at 6 speed settings. 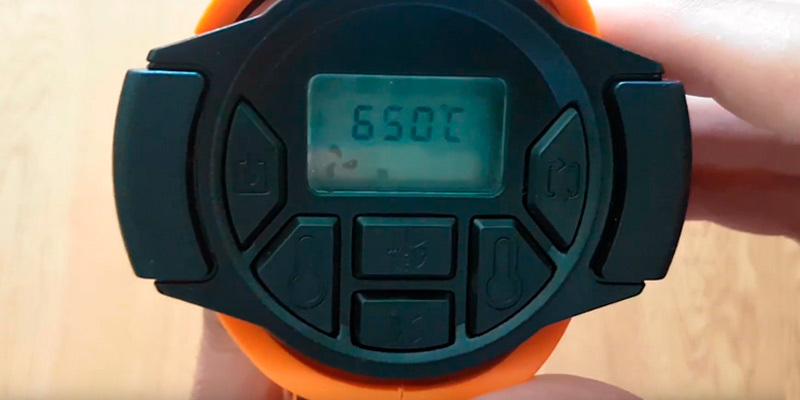 Owing to handy 4 "click" switches and a clear digital display panel on the top of the gun, you can easily adjust the air flow speed and temperature in 10-degree steps. The unit boasts the memory function that allows it to recall the last setting used - this makes it suitable for larger tasks. What is notable, the gun comes in an Angle-LOC moulded carry case that can double as a hands-free gun holder. The package also includes a generous set of accessories ( a 5-in-1 detailed scraper tool for flat and curved surfaces, concentrator nozzle, wide concentrator nozzle, reflector nozzle, and glass protection nozzle). And within the sturdy carry case each item is placed so that it can be easily found. All in all, if you need a professional heat gun that includes everything you might need for your jobs, the Wagner Furno 750 is worth giving a try. 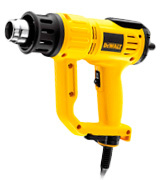 The DeWalt 2000W 240V LCD heat gun is a first class product that comes at a great price. 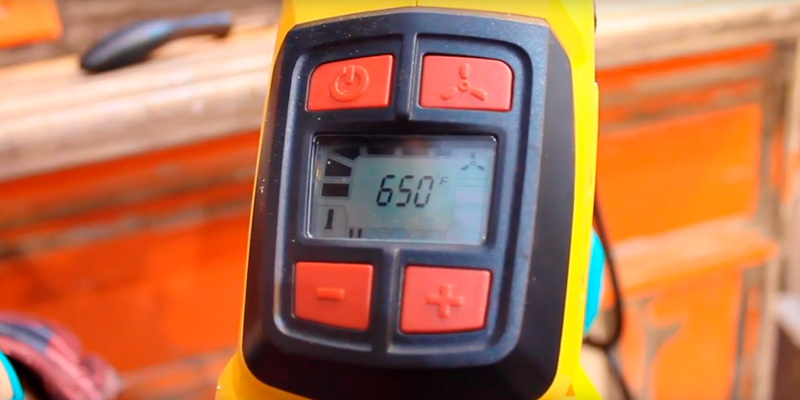 Offering adjustable heat in the range of 50 - 600 degrees C, this premium tool will help you solder, weld, and shrink wrapping to streamline all your DIY projects. 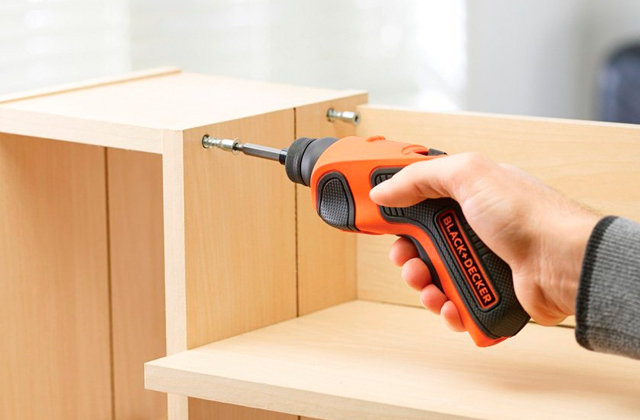 Whilst being advertised as a tool for DIY use, we bet professionals will find plenty of use for it too because it's durable and heavy duty to withstand continuous operation. Plus, the gun has quite a long power cord so you can stretch it pretty far from an outlet, which is particularly useful for work outside or inside the houses that haven’t been finished yet and lack "convenient" power sockets. The stripper is controlled by a large temperature control knob, while the digital readout helps you check the heat level. The "Low" temps are great for drying paint and varnish, waxing/dewaxing, removing stickers, finishing various crafting projects, drying wet timber before filling, shrinking PVC wrapping, as well as thawing frozen pipes. 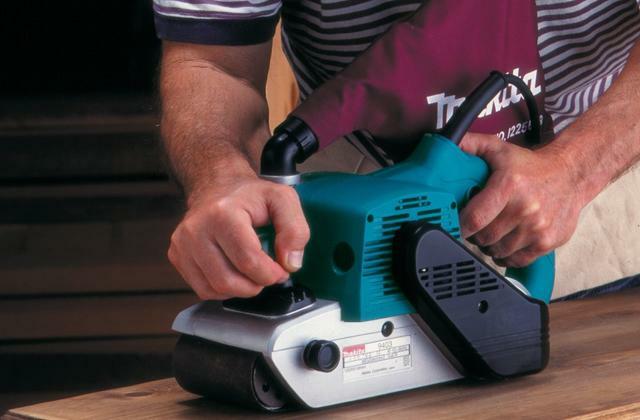 Running on the "High" setting, the gun is best for welding plastics, bending plastics, loosening nuts and bolts, removing paint, soldering plumbing joints, and even removing linoleum/vinyl floor tiles. A nice bonus is, the tool comes supplied with a cone nozzle and fishtail surface nozzle to simplify performing of those jobs. With these wide capabilities, the DeWalt heat gun can suit any worker, professional or amateur alike. 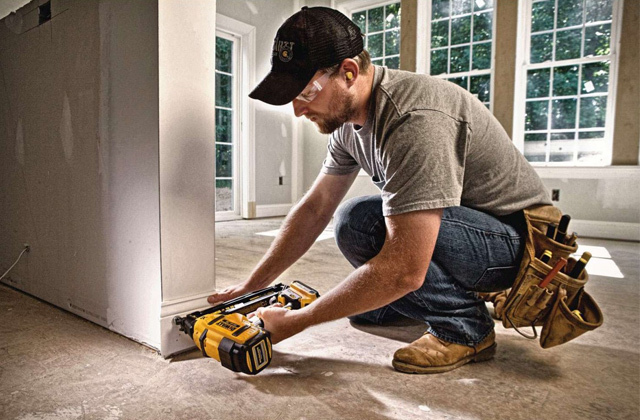 Since 1843, the Stanley Black & Decker company has been producing innovative tools and solutions to help builders, makers and explorers to get the job done. The brand is now famous all over the world for the highest quality of its tools and excellent customer support. 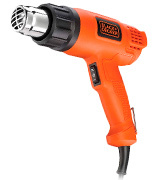 And though this Black & Decker heat gun falls into the "budget" category, everything about it screams high quality. It stands stable on its end, the body never gets hot, and it doesn't smell nasty like it often happens with cheap models. 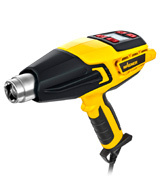 This simple 1750-Watt heat gun has just two temperature settings (460 or 600 degrees C) and two air flow levels (570 or 740 litres per minute), which is still quite enough for such basic applications as stripping paint, varnishes and adhesives, as well as loosening rusted/seized nuts or thawing frozen pipes. The only slight gripe is that it doesn't come with any attachments. However, that's the price for flawless operation and super ergonomic design. The unit is well-balanced and weighs just 600 grams, so it feels uber comfortable in the hand. Moreover, it comes with a built-in stand allowing for its hands-free use. 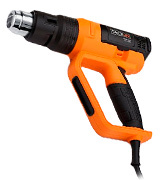 So, if you need a simple yet very comfortable heat gun from a well-known brand, we'd definitely recommend you to take a closer look at the Black+Decker KX1650-GB. If you're not hunting for big names and want to get a simple but good quality tool at an affordable price, the Tacklife HGP72AC heat gun might be the best match for you. It costs less than £50 but comes with all the bells and whistles you might expect from top-tier models. To be more specific, the set of additional accessories includes a round nozzle with a hook, scraper, two scraper blades, fishtail nozzle, concentrator nozzle, reflector nozzle, protective mouthpiece, and even exclusive charcoal lighter nozzle for BBQs and fireplaces. 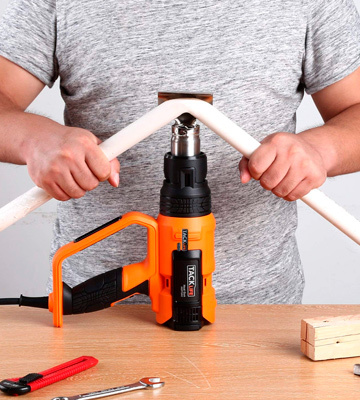 This generous bundle, along with a wide temperature range, lets you perform various jobs like peeling paint, welding pipes, separating glued objects, softening putty around the sink, shrinking PVC, igniting coal, dropping rusted bolts, bending/moulding plastics, and thawing frozen pipes. Speaking of performance, the heater also has quite a lot to offer. With 200 Watts of power, it can produce a heated air jet (from 50 to 650 degrees C) with the speed of 250-500 L / min. Even at the highest temperature, the stripper can continue working for more than 500 hours thanks to the stainless steel air outlet with tube antioxidant. And the built-in overload protection will block the heating element and prevent burning if the gun works for longer. The last but not the least thing to mention is a handy control panel with a large LCD screen. Digital controls allow you to quickly adjust the right temperature, while 4 memory settings enable you to quickly switch between the 4 pre-set temperature/fan settings. As you can see, the Tacklife HGP72AC heat gun has everything people come to expect from premium-quality products but unlike them its price makes it affordable for everyone. So if you don't particularly care about the brand name and simply are looking for a good quality heat gun tool, the Tacklife HGP72AC might be the best deal. 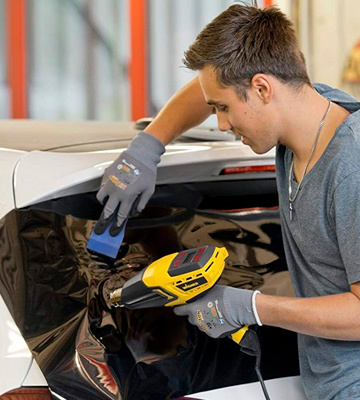 Just like all other tools produced by the company, the VonHaus 2000W Heat Gun is known for its great performance, proving high impact and very versatile. It can be used for a variety of DIY jobs around the house, including varnish and paint removal, decorating, thawing frozen pipes, loosening rusted bolts, loosening adhesive, and bending plastics. Some users even melted sugar and cheese with it. Not like this is what it's intended for, but certainly handy. 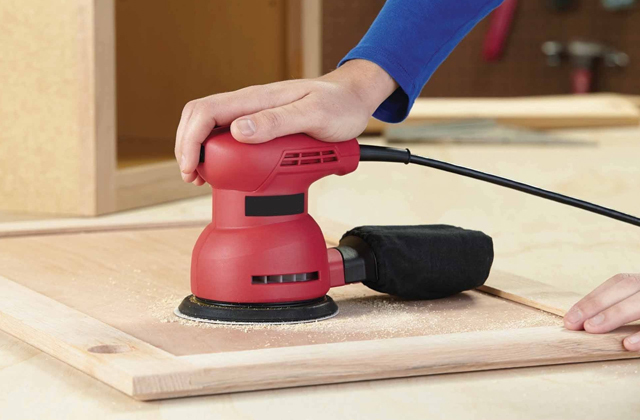 The VonHaus 2000W heat gun is absolutely safe to use. Made from strengthened PP composite, the body along with the plastic surrounding doesn't get warm. Plus, the air vents are located in such a way that neither dust nor paint particles can enter the gun. 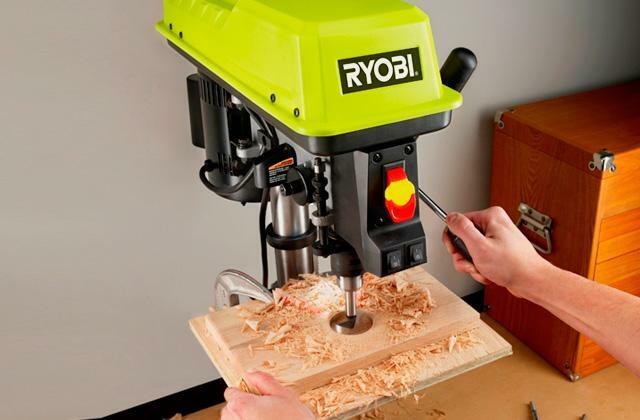 The unit, as well as four attachments, are high -quality and feel ultimately durable. The set of accessories includes a glass protection nozzle ideal for painted wooden windows or door frames; air spreader nozzle for flat surfaces; concentrator nozzle for use in awkward crevices, mouldings, corners, or architraves; reflector nozzle for bending plastics or defrosting frozen pipes. 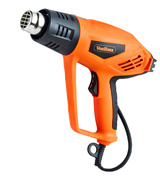 The heat gun has two operating heat settings (350 and 550 degrees C) and an automatic shut-off function to prolong the lifespan of the tool and ensure safe operation. The gun gets very hot, very quickly, and, best of all, in mere minutes. And it doesn't produce any noise during operation. All things considered, though the VonHaus 2000W Heat Gun lacks some frills of more expensive tools and does not feature as many temperature settings, it does its job and does it well. 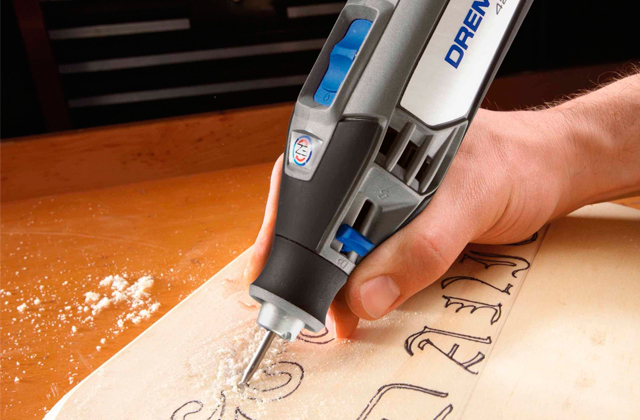 High-quality and versatile, this heat gun can handle a whole host of DIY tasks. 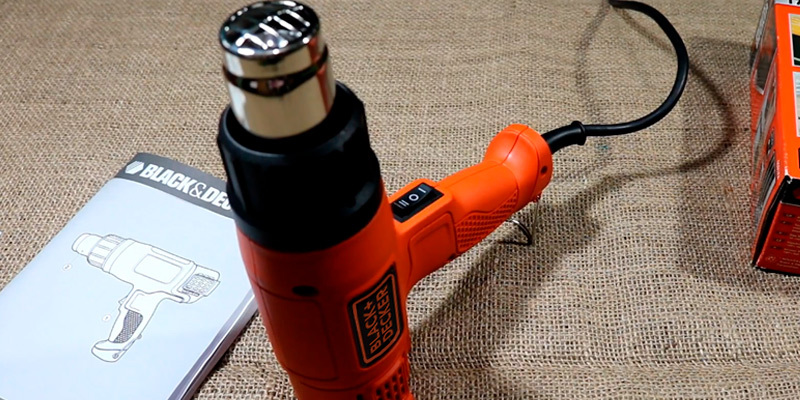 While its name may seem pretty self-explanatory, there is a bit more to knowing what a heat gun is and when you can use it for craft purposes. This small tool is akin to a hair dryer in that it uses hot air to work but the temperatures are, of course, incomparable. A heavy-duty model will easily reach up to 650°C and above, which means you shouldn’t be using one of these on your locks any time soon. 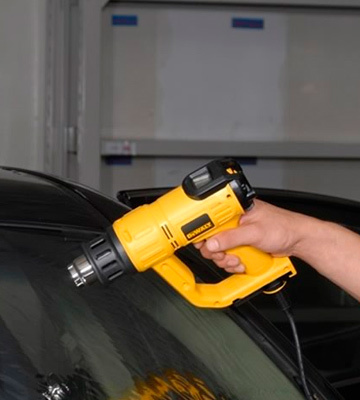 Instead, you can take advantage of this device’s power to strip paint, shrink wrap materials, weld plastic, thaw frozen objects (just make sure they won’t be melted by the hot air), and even dry out paint and glue. Using such a tool requires caution, of course, as the electric device easily reaches temperatures that are dangerous to humans. 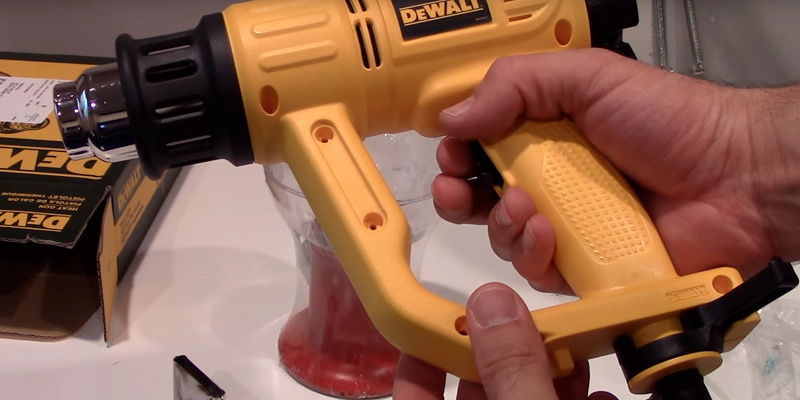 Thankfully, the sleek design of these tools helps practice caution as the heat gun resembles, well, a gun. You can hold onto the handle and trigger while you work and, if your model is well-made without any faults, the body itself shouldn’t get too hot either. It might still be prudent to wear a pair of gloves for protection though. And while you’re picking out the best heat gun, perhaps you’ll want to look into getting a staple gun as well, to help finish off any DIY projects you have at home.